LIKE MUCH OF the nation, New Hampshire is in a frenzy over illegal immigration. In 2005, a police chief from New Ipswich, a sleepy small town near the Massachusetts border, arrested an illegal immigrant, who had pulled over on the side of the road, on the grounds that he was trespassing in New Hampshire. “We’re applying a state law to illegal aliens, instead of federal law, because the federal government refuses to enforce its own laws. Someone needed to bring it, so I brought it,” the chief told the Concord Monitor. The courts threw out the case, but the police chief became a statewide celebrity. During the New Hampshire primary, both Democratic and Republican candidates were peppered with questions about illegal immigration. Senator John McCain, who won the state’s January 8 primary, had to modify his support for comprehensive immigration reform legislation in the face of voter complaints. But that didn’t appease some residents. At a town hall meeting in Pelham in December, Bill, a thirty-something white-collar worker at United Health Care (who asked that I not use his last name), said that he liked McCain but that “he lost me on immigration.” After McCain spoke, the first three questions he got were about immigration. Roy Bouchard, a retired worker at Raytheon, asked, “Senator McCain, there are a lot of veterans in this hall, and we all believe that you are a straight-talker and we want to vote for you. However, there is one issue that bothers me and bothers a lot of people in this hall, and that is illegal immigration.” Bill and others in the audience applauded. There are many places in the country—and along the campaign trail—where immigration is a top issue for a clear reason: It is affecting the livelihoods of longtime residents and has visibly transformed their locales. In Iowa, for example, when campaign buses pulled into small towns like Storm Lake, Denison, and Marshalltown, presidential hopefuls were confronted by voters furious that big meatpacking firms had brought in Hispanic immigrants, some of them illegal, to turn their towns’ reasonably paying blue-collar industry into a low-wage occupation that couldn’t support the average Iowan. In South Carolina, too, candidates have had to face voters angry and bewildered by the swift rise in Latino immigration to their state—the third-highest rate in the nation between 2000 and 2005. “Certain sections of this tri-county area look like little Mexico City,” says John J. Cina, a retiree who, angered over illegal immigration, plans to challenge Senator Lindsey Graham this year in the Republican primary. But in New Hampshire there is no meatpacking industry, or its equivalent. In fact, there are almost no immigrants, illegal or otherwise. According to the Census, only 2.2 percent of New Hampshire residents are Hispanic. The Pew Hispanic Center rates New Hampshire forty-second of 50 states in the number of unauthorized immigrants. Yet the state’s voters, like those in Iowa or South Carolina, are up in arms over illegal immigration. According to exit polls taken on primary night, almost one-quarter of those Republicans and independents who voted in the GOP primary consider immigration the most important issue facing the country, and 50 percent think that illegal immigrants should be deported rather than given a path to citizenship or temporary visas. In fact, if you look around the country, there are many places where there are relatively few illegal immigrants, but where Americans are nevertheless apoplectic about illegal immigration. In Kansas’s predominately white and rural second congressional district, for example, Representative Nancy Boyda has been besieged with questions and complaints about illegal immigrants. And, in a special congressional election last month in northwest Ohio—where a small number of Hispanic migrants, whose presence had never before bothered anyone, pick tomatoes in the summer—Republican Bob Latta ran incendiary ads charging Democrat Robin Weirauch with being soft on illegal immigrants. Latta was able to put Weirauch on the defensive and run away with what was supposed to be a close race. Clearly, the furor over illegal immigration has spread beyond places where jobs have been lost, wages reduced, and public services strained, to places where migrants have not disrupted the local economy. And, even in places like Iowa and South Carolina, the anger was never solely a function of disappearing jobs or overburdened social services; it has been about the use of Spanish on signs and ballots and even grocery lines, and about the spread of little Mexico Cities. Indeed, around the country, the furor is not simply about illegal immigration; it’s more often about Latino immigration, legal and illegal—about what Pat Buchanan calls the creation of “Mexamerica.” Which leaves us with something of a puzzle: How did so many Americans come to feel so vulnerable to what for many of them is merely a phantom menace? How did an economic problem that is concentrated in certain states and regions become a national Kulturkampf? THE UNITED STATES has long experienced bursts of anti-immigration fervor—in the 1850s (the era of the infamous Know-Nothings), the 1880s and 1890s, the 1910s and 1920s, the early 1980s, and the first half of the 1990s. The spell we are experiencing today is only the latest iteration. It began with the September 11, 2001, attacks, after which a Gallup poll showed a 17-point increase in support for reducing immigration. A June 2002 survey for The Chicago Council on Foreign Relations concluded that “concern about terrorists entering the country ... appears to be contributing to the high level of support for reducing immigration.” But respondents were not concerned about immigration per se—they were worried about terrorists sneaking into the country. During the 2002 elections, there was no debate over immigration. The issue was entirely overshadowed by the war on terrorism. Immigration barely surfaced in the 2004 elections, either—both George W. Bush and John Kerry, seeking Latino votes, took a conciliatory approach toward illegal immigrants. But widespread concern was simmering at the state level just beneath the surface. Just as the furor of the early 1990s began in California, this period of anti-immigration activity began in Arizona in response to a huge influx of legal and illegal Mexican immigrants driven to the state by recent improvements to border security in California and Texas. (See John B. Judis, “Border Wars,” January 16, 2006.) By 2004, almost two million people were crossing Arizona’s desert border with Mexico every year, and some of them, attracted by the state’s booming economy, stayed. 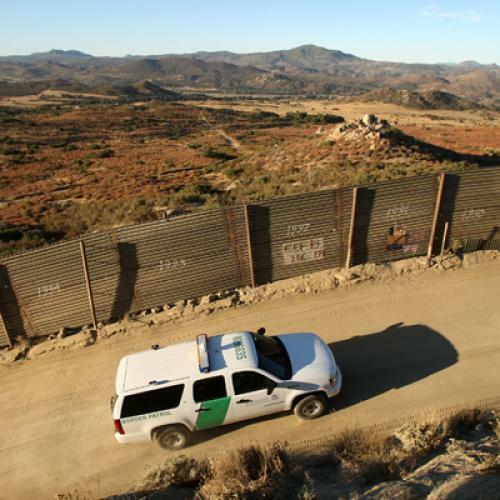 According to the Pew Hispanic Center, the number of illegal immigrants in Arizona went from 115,000 in 1996 to almost 500, 000 in 2004, straining city and state budgets for police, schools, and hospitals. In 2004, anti-immigration activists put Proposition 200 on the ballot. It denied “public benefits” to illegal immigrants and required public employees to report anyone suspected of being in the country illegally. Although almost the entire Arizona political establishment opposed Proposition 200, it still passed, 56 to 44 percent. The passage of Proposition 200 inspired a spate of legislation across the country aimed at legal and illegal immigrants. According to the National Council of State Legislatures, 570 pieces of legislation dealing with legal and illegal immigrants were introduced in 2006 and at least 1,562 in 2007. Many were aimed at denying benefits to illegal immigrants, but others imposed onerous voter-registration requirements for legal immigrants or banned languages other than English from public documents, including ballots. In 2007, immigration bills became law in 46 states, including Wyoming, South Dakota, North Dakota, Montana, and West Virginia, which have very few immigrants. New anti-immigration organizations also emerged, including the American Border Patrol, whose founder warns that “immigration ... is allowing Mexico to colonize the American Southwest,” and the Minutemen, which boast chapters in almost every state. The Minutemen even have two chapters and a state headquarters in Wyoming, where the entire foreign-born population amounts to only 2.5 percent of the state’s citizenry and illegal immigrants less than 1 percent. Overall, there are more than 50 such organizations spread across the country, appealing to anti-Latino sentiments. Nationally, the chief ideologues of the anti-immigration movement usually give precedence to cultural arguments over economic ones. CNN commentator Lou Dobbs warns that the United States is becoming a “Third World country.” Colorado Representative Tom Tancredo laments that “we are undergoing a radical change in our national character and social structure, not to mention language. “ Pat Buchanan (author of the best-selling State of Emergency) asks, “Will the American Southwest become a giant Kosovo, a part of the nation separated from the rest by language, ethnicity, history and culture, to be reabsorbed in all but name by Mexico from whom we took these lands in the time of Jackson and Polk?” Dobbs, Tancredo, and Buchanan have helped to transform what might have been a regional movement into a national one. Their names invariably come up when talking to local activists. But their advocacy doesn’t entirely explain what happened. TO UNDERSTAND THAT, you have to examine the movement’s historical antecedents—a strain of political protest that begins in the late Jacksonian era with the Know-Nothings and continues through the Populists of the nineteenth and twentieth centuries to today’s anti-immigration movement. It is based on the displacement—sometimes with cause, sometimes without—of deep-seated social and economic anxieties onto an “out-group,” and it is voiced most often by the “intermediate strata,” the social and economic classes most threatened by the development of capitalism. In the nineteenth century, the intermediate strata comprised urban artisans and small farmers; in the twentieth century, small businessmen, farmers, and craft workers undermined by industrialization; and, more recently, workers who lack adequate technical training or whose jobs are being sent overseas. These workers have seen themselves as “producers” victimized by “parasites”—by Wall Street and big business from above and by an underclass of African Americans and immigrants from below. Today’s anti-immigration movement is rooted in these intermediate strata and in this neo-populist ideology. According to an extensive 2003 survey sponsored by Hamilton College, opponents of immigration are particularly concentrated among those who have no more than a high school diploma, make less than $50,000, and live in small towns or rural areas. According to a poll conducted in December by Democracy Corps, those who believe that “immigrants take more from our country than they give” are strongest among men between the ages of 30 and 39 without a college degree. This is a rough approximation of those Americans who work at a lower—but not the lowest—rung of blue-collar or white-collar jobs, who own very small shops or businesses, and who are most susceptible to losing their jobs or income in economic downturns or through outsourcing. Concerns about immigration were overwhelmingly driven by public benefits, and it quickly turned into a broader discussion of welfare and the clear line drawn between those who contribute to our society and those who abuse the system for their own selfish gain. ... [T]here was also agreement that too many come to this country to abuse our generosity—taking welfare benefits, using emergency rooms for their routine medical needs, getting a free education for their kids—without contributing to the system that provides such generosity. If you look at the areas where anti-immigration sentiment is rife even though there are few immigrants, they are filled with native-born Americans who find themselves threatened by the new global capitalism. The northwest Ohio district that Bob Latta won was once dotted with factories working overtime, but, over the last decade, the companies have either cut back or closed down. Many of the residents are beleaguered blue collar workers looking for an explanation for their plight. Latta gave them one in illegal immigrants. Similarly, Boyda’s Kansas district is filled with towns that have seen better days. I accompanied her to Burlington, a sad little prairie town of 2,700—only 28 of whom are not American citizens. There, attendees at a town meeting complained vociferously about “illegal aliens” and, in true populist fashion, charged that big business “controls everything.” Afterward, one of them told me jokingly that I should come live in Burlington. “It’d be like getting out of an Indy car and into a Model T that is going backwards,” he said. THESE PEOPLE in rural Kansas or northwest Ohio, who feel left behind by capitalism, are susceptible to the darker side of populist appeal—to blaming those less well off than themselves for their plight. But why have they singled out immigrants, specifically Latinos moving north? In the past, anti-immigration movements have erupted in part because of an actual increase in immigration and an economic downturn, whether an overall recession or depression or a selective downturn, as happened in the first half of this decade. But, in these periods, there has been an additional factor that has fueled Americans’ cultural concerns about immigration and led the movements to take a nativist turn: Each period of anti-immigration sentiment has coincided with a loss of confidence in the cohesion and resilience of the American nation. In the 1850s, Americans, increasingly fearful for the breakup of the union over slavery, became alarmed that Catholic immigrants from Ireland and Germany would undermine republican institutions. The Know-Nothings were determined “to resist the insidious policy of the Church ofRome and all other foreign influence against our republican institutions in all lawful ways.” The anti-immigration movements of the early 1920s took root amid disillusionment over the results of World War I and fear that the United States would be dragged into another European conflagration. And, in the early 1990s, anti-immigration fervor was fed by fears that the United States was becoming a second-rate economic power. In recent years, this concern about Latino immigration has been fed by a broader anxiety about America’s place in the world. That has been prompted by the failure of the Bush administration to complete its missions in Iraq and Afghanistan; by the rapid rise of gas prices (making it appear that the United States is at the mercy of foreign oil producers); and by growing doubts about the buoyancy of the U.S. economy. This perception of decline shows up, among other places, in the polls that ask people whether “things in this country are heading in the right direction, or ... off on the wrong track.” According to an Associated Press-Ipsos poll, the percentage of people thinking the United States is on the “wrong track” has risen steadily over the last four years from 46 percent to 68 percent. In surveys by Gallup and World Public Opinion, the percentage of those who were “dissatisfied with the position of the United States in the world today” rose from 30 percent in April 2003 to 51 percent in February 2005 to 68 percent in October 2006. These fears also crop up among local anti-immigration activists. Malzone sees illegal immigration not just as an unwelcome intrusion, but as a symptom of national decline. A wiry man with graying short hair, a goatee, and a heavy New England accent, he pounds his kitchen table for emphasis as he talks. “I love my country, and I think it is important to keep it going, because I see it failing rapidly,” he says. “I’m only forty-seven years old, but I never thought I would get to the stage where I sounded like my grandparents. Oh my god, things were never this bad. Did you ever think things would be this bad?” At a McCain rally in Conway, New Hampshire, a woman asks McCain about making English the official language. “I’m terribly concerned there’s real danger we’re going to lose our country from within,” she says. This concern about national decline is what sustains the cultural argument against Latino immigration. THESE BURSTS of anti-immigration fervor are cyclical. They have eventually abated. The anti-immigration movement of the 1920s dissipated soon after Congress passed draconian restrictions on immigration in 1924, although a residue of nativism persisted well into the 1930s. In the 1990s, the anti-immigration movement, which scored a victory with California’s passage of Proposition 187 in 1994 and was embraced by the new Republican majority in Congress, dissipated after the 1996 election largely because of the Clinton economic boom. With income and employment rising, Americans no longer felt as threatened by globalization. Fears of job competition and strained social services persisted in affected states, but they did not give rise to a national furor over illegal immigrants. Immigration disappeared as a national issue. What are the prospects that the current furor will abate in the near future? Not good. Congress passed, and the Bush administration signed, legislation increasing border security, but it will have no bearing on the estimated 12 million illegal immigrants already in the United States or on the source of 40 percent of new illegal immigrants—those visitors who overstay their visas. And, with American businesses continuing to demand low-wage workers and with Mexicans and other Latinos eager to escape poverty, pressure to allow immigration will only increase. At the same time, the United States appears headed for a recession that will heighten Americans’ economic anxieties and fear of global decline and spark new protests over immigration. The clamor over illegal immigration can be expected to grow over this year and to play a large role in this fall’s election debate, as it already has in the congressional by-elections that have taken place since November 2006. Which party will benefit is unclear. Will the Democrats, who have generally favored a liberal immigration policy, make up in Hispanic votes what they might lose in support from Reagan and Bush Democrats? Or will Republican candidates be able to follow Latta’s example and parlay the furor over illegal immigration into political victories? It’ll probably depend on the kind of voters that reside in a particular state or congressional district. What is certain is that the United States, which has grown and prospered as a nation of immigrants, but which must now urgently find ways to regulate their flow, will suffer from this acrimony. This article appeared in the February 13, 2008 issue of the magazine.